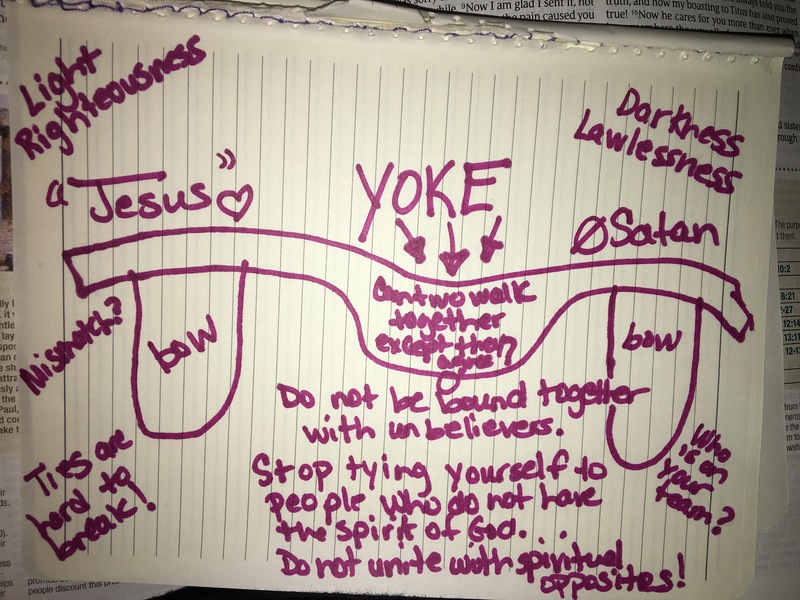 Who is Tied to Your Yoke? by Dr.J. Who is in the bow of the other side of the yoke to which you’re tied? Are you equally yoked? If it could possibly cause you to compromise your faith and ultimately your relationship with God, why hook up with someone with whom you’re unequally yoked? Yes love. Yes minister. Yes witness. But do not become spiritually (or physically tied) with unbelievers or “said” believers whose life doesn’t line up with their profession. Can light partner up with darkness? Can righteousness and wickedness hang out? Can Jesus and the devil be harmonious with each other? Someone is chasing someone down right now for him to slide his neck into the bow of your yoke to hold you back, weigh you down, and ultimately delay your destiny because of your own disobedience. You two aren’t even headed in the same direction. You’re not spiritually strong enough to pull a hardened heart. Stop fooling yourselves that God wants you to stay so you can fix it. God said separate yourselves right now. You have too much at stake to stay tied. The load we have to carry is burdensome enough without dead and deadly weight. Untie yourself now. 2 Corinthians 6:14 Do not be unequally bound together with unbelievers [do not make mismatched alliances with them, inconsistent with your faith]. For what partnership can righteousness have with lawlessness? Or what fellowship can light have with darkness? But then, Jesus said for us to take His yoke upon us because His yoke is easy and His burden is light. So, once we are free from the yoke of the world, we can connect to the yoke of Jesus. Dr.J.